During the operation of backup, the function of image file compression can help to save the disk space for storage. The backup software of AOMEI Technology also possesses this function. The more files that need to be backed are, the larger the image file storage space will be. 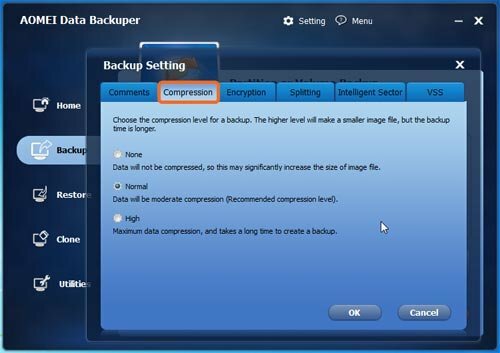 If you need to do regular data backup to ensure data safety, you may also need the function of compression to reduce the storage space of image file. For example, the space of C Drive is 20GB, but the image file just occupies 5GB. That is the magic effect of compression. AOMEI Backupper provides the function of compression to the image file, which includes three levels: None, Normal and High. The option of "Normal" is set as default. You can set the compression level according to your own needs during backup. None: The software will not compress the image file during backup. Its advantage is that the speed of backup and restore is fast, while its disadvantage is that the image file needs more storage space. Normal: It is the recommendation level of compression. It will compress the data to a normal extend. As for speed of backup and restore and the storage space of the image file, this level is the best choice. It will not occupy much space or cost much time. High: It will compress the image file to the largest extent. It will cost a little bit more time in backup and the decompression in restore. Here come the operating steps. 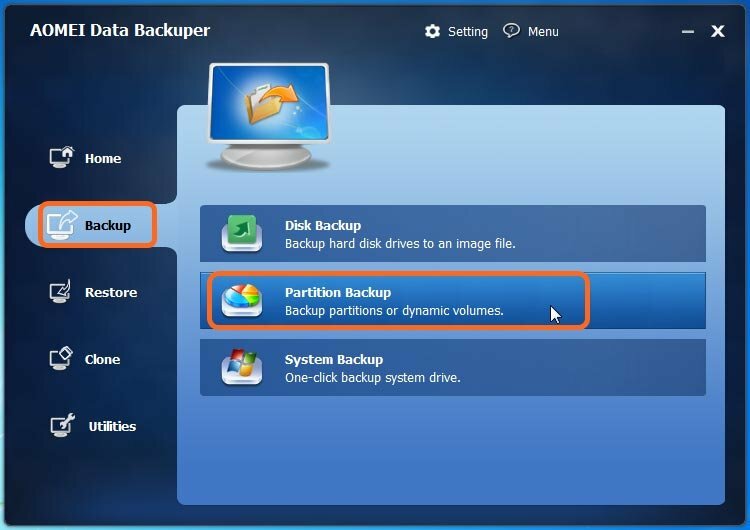 After selecting a backup type ("partition backup" as the example), you will enter a setting page. After setting the source and destination partition, you can compress the image file by clicking "Backup Options". In the pop-up interface, click the "Compression" option, and there will be three compression level available: None, Normal and High. After that, click "OK" to save the settings. Ideal compression rate has a closely relationship with the file type of the files that need to be backed up. For example, if the type of the files that you backup is all jpg, .mp3, .avi, it is hardly for you to reduce the storage space of the image file even if the selected compression level is "High". But if the type of files that you backed up is .txt, .doc, .xls, the compression rate will be much higher.